A surprising number of us (bristling with hope and hubris I suppose) took up the offer. The ensuing session was, to date, the most illuminating experience I’ve had as a writer. The key message we all took away? If we wanted to be truly great writers, we had to first write many, many words. And then we had to be willing to walk away from the majority of them. A rambling 900-word tribute to someone dearly departed? Ruthlessly whittled down to 250 emotion-laden words that cut the reader to the core. At the end of the session, our instructor told us not to feel dismayed. She applied the same ruthlessness to her own work; three out of four blog posts she wrote never saw the light of day. This was revolutionary to me. Previously, I assumed that if I’d spent any amount of time writing and editing it, then the content was worth publishing. After? I discovered the truth in her lesson and found that throwing away words made the difference between simply creating content and creating content that resonated deeply with the world. I also found that while my “throwing-away-words muscle” was pretty weak initially, the more I used it, the stronger it got. So, how do you exercise that muscle? These three activities helped me. As someone with limited time on her hands, I always felt pressure to make the most of my precious writing hours. I decided to stop with the “first drafting” and instead use Morning Pages the way they were intended — as an exercise for writing 750 stream-of-consciousness words. It was astonishing to see the incredible thoughts and ideas that emerged from that pressure-free environment; they were ideas I’d never have accessed without the time, space, and permission to write hundreds of words I might never use elsewhere. I always used to type first drafts on my computer … and I also would edit along the way. This is bad form: Editing as you write is not terribly efficient, but worse than that, I was extra reluctant to let those words go — even if I knew they weren’t working — because it had taken so much effort to produce them in the first place. I was more willing to let an idea go if I realized I couldn’t effectively communicate it. I’d start writing about one idea and then another, much better idea would emerge. I’d write my first draft at night and my subconscious would ponder it while I slept. The next day, my second draft was always infinitely better than if I had typed the first draft. I remember reading a post by Leo Babauta about the iterative approach he took to writing Zen Habits: Mastering the Art of Change. He initially wrote what he called a “minimum viable book,” put it out in beta to a select group of readers, and gathered their feedback. Then, after a considerable amount of editing based on their feedback, he started again from scratch. He started again from scratch? That sounded like a nightmare. But then I started giving myself more lead-time when I wrote articles. Having considerable breathing space between each draft helped me see when I needed to start again in order to communicate an idea more clearly. The key was, I now had time to do a complete rewrite instead of trying to edit the existing piece into something workable. Many writers I know don’t complete their final drafts until the last moment, fooling themselves into thinking they work better under pressure. I used to think that too. And, certainly, I’ve always been able to produce work that is “good enough” while under pressure. 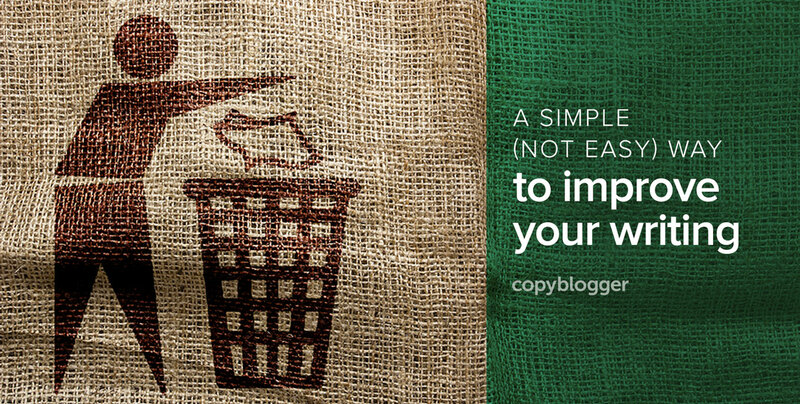 But I want certain content I write (like this article for Copyblogger) to be better than “good enough.” I want my writing to change how people think and move them to take action that makes their lives better or easier — or makes the world a better place. For those pieces of writing, I make sure I set aside enough time to write thousands of words to start. Because I know that’s the surest path to the words I really want. The ones that are great. Hey Bill – absolutely. If you can say it in 100 words … don’t write 200! Kelly, your inspiring piece was definitely worth your time and effort. My copy of “Morning Pages” is collecting dust at the moment. You’ve moved me out of my chair to take it off the shelf and begin…again. Thank you! So glad Missy! Some really super stuff has been coming out in Morning Pages for me recently. Writing long hand just does something cool to the brain! I enjoy writing but I always stop halfway because my mind is flooded by clutter/noise. Reading your article opens my eyes in opening the heart to write a post firstdraf long hand and decide on the next step. Kelly! SO awesome to see you here on Copyblogger and LOVE your post. I really need to make time for free writing and also, not editing as I write. It is SO tough to do! Hey Prerna – thanks you as always for the lovely support! And yes, it feels so hard to make that time for free writing – we have so few writing hours available to us! But it’s really made a huge difference to my writing. Great read, Kelly. Thanks for sharing. My one concern about morning pages, as I clicked through to watch Julia’s video, is that once you write all those negative thoughts, they do not disappear, they become reality – unless you discard them immediately. What are your thoughts on the theory that whatever you write will come to be? This may be very true, “I’m not good enough” often makes us just that. Self defeat is a monster and to let it in a little is enough to ruin. Where can we find more information on this “idea” or “concept”, I’d love a study or two..
I’m off to look for more info I may be right back. Thanks for sharing that thought Kelly. It is really helpful to have an arsenal of thoughts and practices to be at the ready when things are not going our way. I’m aiming for a quiver full of arrows and now I have another one to add to my list! This was such a helpful post for me, Kelly! I’ve been writing Morning Pages and so much comes out of this time… But when I sit to actually wrote a post I have felt like I have to write at the computer – like “people” (because I have people looking over my shoulder while I write apparently) would look down on me for writing with a pen and paper!! Overall great reminders about the value of editing! Thanks for the encouragement! I made huge gains with my writing once I started doing my first drafts longhand. It really is so freeing! And makes for a cracker second draft! I will definitely try writing on paper versus on computer, worth a try. I know I can use improvement. This is excellent advice! I come from an academic background, just finishing my MA by research, and this is my first job as a content writer. Some of the points you raise, like writing longhand I’ve been doing for years, thinking they were time-consuming only I found them really helpful in those dark moments when you stare at a blank computer screen and you wonder why you’re doing this to yourself over and over again. I almost never keep the first 2 or 3 drafts I write, and then I’m stifled with panic before the deadline. As you say, my work is immensely better in the end, but I really have to work on my time management skills. It is really liberating to find out that other writers face these problems and also exhilarating when you see that you’re doing something right! Hey Maria – it’s always nice to know other people are experiencing the same things isn’t it?! I think the real key (for me anyway) has been to really give myself a good amount of time to write the important things so I can give them room to breathe and re-write with rushing. It’s the rushing that I alway find leads to an unsatisfying final piece. Which is a shame given how much time we spend writing these things! Great article and advice, I really need it! I am not a writer but I do blog about business (how to build, prosper and grow). It is a huge struggle for me to get the info out there that I want. I will take your advice for all of this and especially the at night part and come back to it. I find that when I write and publish it is always about a day later that I realize I could have said it much better. Again, great advice and a huge thank you from a non-writer writer! Great article Kelly. Totally agree. It can be extremely difficult to be ruthless with your own work because you’ve spent so much time writing it in the first place! It feels like a total waste of time and effort if you just hit delete, but it’s VERY important. I always find that coming back to my copy the day after helps me to re-evaluate which lines are ‘golden’ and which can be jettisoned. Definitely so hard to be ruthless! But that extra day or two really makes all the difference, as you have said! Terrific article. Ironically, a great article on writing, about writing (that is hard to do). Find the one single golden line is great direction. Aside from web writing, I am also involved in songwriting. It employs the same tenants. I spoke to Brad Roberts of the Crash Test Dummies years ago, and I remember him telling me something to the effect of “writing was quantity, not quality”. Implying that he writes, and then edits (he is a great lyricist by the way). Anyway, thanks again. Thanks for those beautiful lines. Specially “Start again with just that line. Throw away the rest.” It takes a lot of strength to start all from scratch. I am thinking to give it a try but am unable to extract the strength. Lets see! It sure does take a lot of strength – but I’ve done it a good few times now and the final result has always been so worth it. So it’s getting easier and easier to do! Nice post and great quotations. I usually set up a goal once a week to write 1000 words in one sitting. I will take your advice and edit them along the way to save important time. Thanks for sharing this article. Cheers! Thank you for this post. I loved it and will apply it to my writing. What’s the natural follow up advice or post that I can extend to my students? Kelly, the single, golden line for me was: “I want my writing to change how people think and move them to take action that makes their lives better or easier — or makes the world a better place.” Thanks for that inspiring reminder. I’m posting it by my desk. The biggest thing I have done is that I frequently read my competition to see who’s saying what. There are only 1 or 2 who, when I read their materials, just leap off the page. When I find there best articles, frequently I’ll try a rewrite around what they said. That’s when I find that there are certain emotional twists they use that GRAB the reader. So after trying to take their approach, and rewriting to what I want to say, I get much closer to being as emotionally grabbing as they do. From that point, I’ve learned what GRABS, and can do that in my own writing from here on. The more I do this, the more I learn, and the better my own writing gets. I tend to be a fact type of person, so I tend to say things rather unemotional and to the point. So studying how others truly connect emotionally, I learn how to do that. Yep – I’ve spent many hours over the years breaking down articles that have grabbed me and getting an understanding of what the writer has done to captivate me. The best way to learn I reckon! The phrase, “If it doesn’t add, then it subtracts.” applies to many areas of life, e,g, weight, clothing, accessories, etc. But most certainly it applies to writing content. “Less is more” also applies. When I write about a new service or product for my biz, my nose is pressed to the glass. I struggled with this until I engaged a professional editor. He looks at my first draft descriptions and comments on them. While a professional editor is a luxury, his comments enable me to write a better second draft or final content. I used to fool myself that I wrote better under pressure. I gave up that belief after about 20 years of trying to make it work. Now I write and rewrite articles for publications because they represent me and my business. I am going to try Morning Pages tomorrow as I have two 250 content pieces that are due soon. Perhaps Morning Pages will lessen my procrastination. Question: my handwriting is so terrible-really terrible; should I struggle to produce handwritten content or stick with my computer without editing? Ah – I love having an editor to fall back to when I am too close to a piece. It’s so helpful! Thank you Kelly. I traded just writing for the constant push of structure and planning. You are correct, the best ideas often come from free writing and then need to be rewritten and rewritten to become truly great content. I did the structured and planning thing for SO long. But I kept finding that even with all the planning, I’d find myself in a position where I just wasn’t hitting it with the piece. But I’d feel locked into that plan – committed! And those pieces never came out as well as I liked. Things got a lot better when I took the looser approach! Another great article from the great copybloggers. Kelly your words are an inspiration and came at the perfect time. You guys are mind readers over there. Thank you for sharing this wonderful piece. I like the concept of Morning Pages. Have to give that a try. As to writing longhand…. you clearly have never seen my horrible handwriting. I can barely understand it after I write something. I think I’ll stick with my computer. Seriously – try the longhand anyway. My writing is also atrocious but I find I never really refer back to what I’ve written out by hand. The handwriting stuff simply engages my brain, shakes down the best bit of the idea I have – and then I start a fresh new ‘second’ draft around that idea. Fantastic article! I have realized what a necessity writing is in the online world (which is one reason why I am here) these articles have really helped me improve my own writing. Thank you so much. Excellent advice Kelly! This reminds me of an episode of Dave Grohl’s Sonic Highways series when he talks about all the songs he wrote and recorded that never saw the light of day. He never intended them to be published. He just needed to exercise his songwriting muscles. All that practice paid off later on all the Foo Fighters albums. Love that Bryan – it’s definitely the same principle! Thank you, Kelly. A great article and you obviously practice what you preach. I am guilty of editing as I write, and I know I shouldn’t, but I agonise over every word and comma. You have put forward the best argument yet for free writing and I think I’m finally convinced to give it a go. I have a lot of trouble throwing away words, too, though I’m getting better at it. If I’ve written something I find particularly inspiring or insightful but it doesn’t quite fit in the full body of text, I may save it somewhere else, just in case it fits in another piece. You never know! Oh yeah – always save those darlings somewhere. You never know when they might get a run!! Thanks for sharing these great insights! It’s tough to find good writing critiquing and I’m always looking to improve. Do you type or hand-write your morning pages? Hand-write. I used to type them – and I could type them in 15 mins compared to 30 mins writing longhand. But the stuff that comes out writing longhand is heaps better! This is insane. Imagining someone credible and great writer doing a critique for my work. The key takeaway for me is – write, edit, accept it is not good, repeat till you create the best content. When it takes time and guts to do something, the end result is better than what others do in single take. Loved the post. Stay Awesome. It was quite wonderful having someone critique my work. Hard to hear, but hugely instructional! Thank you for sharing! I always felt pressured to “sit down and write” when I had set aside a certain amount of time for it. But this changes my complete perspective. It’s good to know that I need to give myself “free time” when writing. Yes – and the beauty of free writing is … no pressure. So nice to write with no pressure! Great piece Kelly. While I feel a little bit physically ill at the thought of all those “good enough” words being thrown away, I know that you’re absolutely right, and I should do more throwing away. I used to – I guess it’s when time for me got so limited that I found I just couldn’t! But you are RIGHT! I know! But it is so freeing too. I once wrote 1000 words for an email newsletter … left it to sit overnight … then came back to it the next morning and realised it was all self-indulgent tripe. I knew it couldn’t be saved by editing so binned the lot and started again. What came after was so, so much better. And the whole experience made it so much easier to bin entire pieces after that! Some thoughts on first drafts, which are often viewed as suspicious, and for good reason. Invariably they need to be edited, right? But we writers owe it to ourselves to take a different tact when it comes to the first draft and recognize the incredible energy and unmistakable magic that comes with one. That’s what Morning Pages are, in part, intended to do–draw from your subconscious its creative genius, its skill at finding patterns and making something out of them, its ability to make amazing connections and then draw subversive conclusions. And the language that comes out when you do! Do whatever it takes (jogging, listening to music while you write, write to a prompt) to make your first drafts lush with possibility. Your final draft will be that much better for the consideration. Great article, Kelly. Must learn to channel my inner buddhist! Less attachment to our words. Create more space (and time) between ourselves and our work. Thank you. Space and time are definitely the magical ingredients. Given space and time, the darlings that needs to be killed in our work become glaringly obvious!! Oh this is so true. I made up one of this scary lady memes that says DELETE ALL THE WORDS, printed it out and stuck it up on the wall at my workplace. I think that pretty much sums up my philosophy on good web writing! Yet, do I practice this advice? Hardly. Why? Because as a corporate b2b staff copywriter time usually doesn’t permit. Therein lies the answer: I must force myself to start first drafts sooner. Then I can completely trash them and begin from scratch. Hopefully with a piece that’s not, as Hemingway says, sh*t.
Heh you’re welcome Jim. Time is definitely the key. We can’t give time to every single piece we write when we’re producing a lot of content, but we can certainly give time to the important ones. Great idea. i think i will try it to see how it goes. i always write my drafts in a schematic way at first, with only the main ideas, then i expand on that. Like a mind map almost?! Great article. I wish I could do longhand writing but I have not written longhand a lot since the year 2000 (when I first used a computer) so I am to continue to use my computer for typing. But one thing I am doing more and more regularly is to abstain from editing while I am writing the first draft. I first create the first draft using whatever comes to my mind, and without worrying about formatting or editing. Then I take a break (which may be of few minutes or few days) and come back and update the original draft. This practice suits me and I think it’s helping me to become a better writing. Thanks for this lovely piece of writing Kelly! Great article Kelly, shared across all platforms. Must try Morning Pages sometime. Definitely give it a go Nicola – life-changing! For years i have been churning content. New , old, Recycled and more. After reading your article i think i will have to dump most of the blog posts. Fortunately i find a lot of sense in whats said here. I wouldnt feel a bit of guilt even if i had to remove 1000’s of my pages from nearly 40 of my websites. Thank you kelly. I think you just threw some light on my path! Couldn’t agree more. The best way to write well is to write. Well, and to read lots of good writing. Waaaooo amazing article! SO HELPFUL! Im been recomending this blog to everyone. Every time I create a video with some copywriting content, I always recommend Copyblogger. Great advice! It seems soo hard for me to start longhand drafts and add an extra time, but hopefully I can improve it over time. Hi Kelly, Awesome and worthwhile read! I always looked at my Morning Pages as a place to “dump the junk,” but I’m finding great ideas do emerge from that time. And I love writing longhand and then transferring the draft to the computer. The pen to paper seems to stimulate my thinking. Ha! Love the ‘dump the junk’ thing. That’s definitely what my Morning Pages look like!